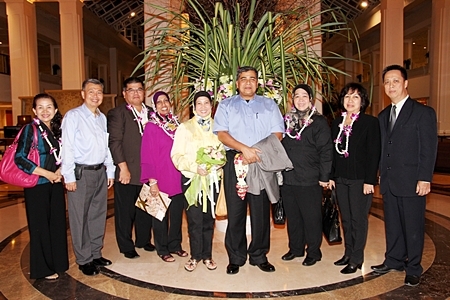 Neoh Kean Boon (right), Resident Manager of Dusit Thani Pattaya is seen welcoming Tan Sri Dato’ Sri Khalid Bin Abu Bakar (fourth from right), deputy inspector-general of Royal Malaysia Police and Pol. Gen. Suwat Chanitthikul (second from left), deputy commissioner general of the Royal Thai Police and other officials who came to Pattaya for the annual gathering of top brass police officers in the spirit of cooperation and camaraderie. The two countries alternately host the annual get together and this year, it was Thailand’s turn to welcome them and challenge the visitors to a friendly game of rugby.